We are requesting that you please read all the information provided on this page and other sale pages before emailing to ask what we have for sale or other information about sales. Most of your questions can be answered by reading all the information on this and other sale pages. I will be happy to answer any questions you might still have after you read these pages. Prices are subject to change at any time for any reason. Availability is subject to change at any time for any reason. Contact me for a current sales list. We are not a hatchery and do not mass produce birds. Quality not quantity is our philosophy. We hatch a limited amount and accept limited requests to be on the waiting list. I have young started stock available each fall. Contact me for a list of available stock. I begin taking orders for young started birds – fall delivery, pick-up, and shipping – on April 1st of each year. I stop taking orders for young started birds on December 31st each year. Those with inquiries and requests for young started birds after December 31st will need to contact me on or after April 1st of the next year to be placed on my wait list. If you do not contact me early then there is the chance that I will run out of the breed or color you are wanting. 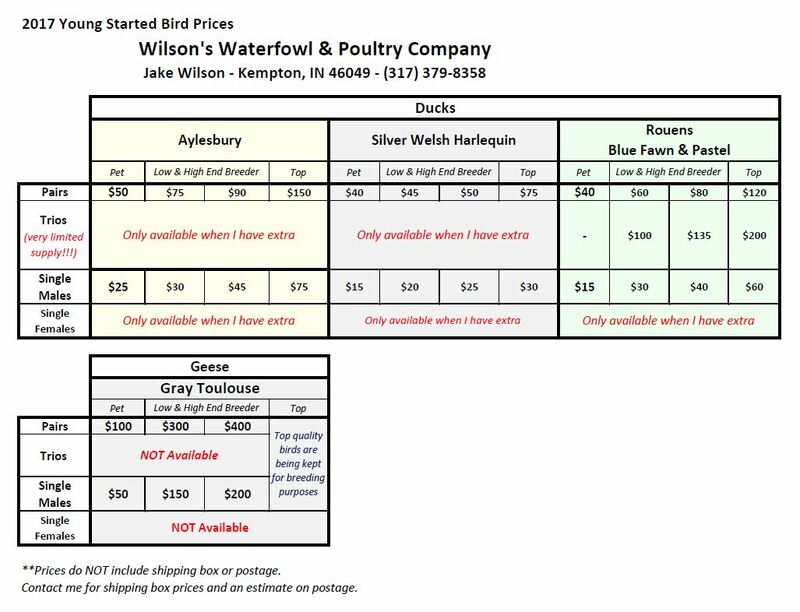 If you know you want birds from me but it is after December 31st and before April 1st please feel free to contact me with your questions but also know that it is your responsibility to contact me again after April 1st to be placed on my wait list for birds. I will try to post prices before April 1st and update if needed once the hatching season is complete and I have a better idea of how many and what kind of stock I will have for sale in the fall. Prices vary according to individual quality. Pet quality and lower end breeder birds will become available first. High end breeder birds and show birds will be available later and not before October. The birds will be ready when I have been able to evaluate them properly. I fill orders on a first come first served basis. 2018 hatch prices have been uploaded and 2019 prices are pending. Click on Download File BELOW to download a PDF file of a list of prices. 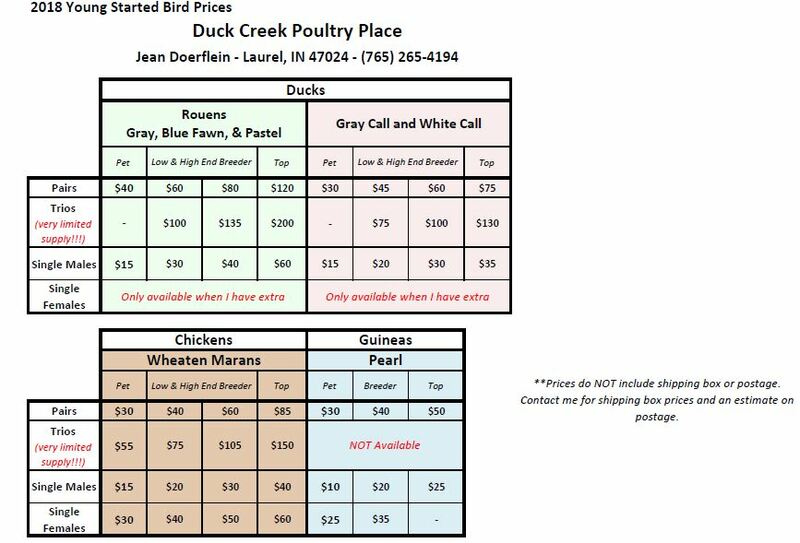 Yoing Started Birds from Wilson's Waterfowl & Poultry Company can be ordered through Duck Creek Poultry Place or by contacting Jake Wilson directly at (317) 379-8358. Wilson's Waterfowl offers superior Aylesbury ducks second to none in the country and outstanding Silver Welsh Harlequin ducks as well as a partnership with Duck Creek Poultry Place offering the highest quality blue based Rouen ducks you'll find in the country developed after year's of painstaking care on both farms. Please see the price list to view both farm's information. If you have any questions both Jake of Wilson's Waterfowl or Jean of Duck Creek Poultry Place will gladly answer them. Thanks! Sometimes I have pet quality stock available. My pet quality poultry usually have comb, color, size, and/or feather defects and do not have serious malformations or physical defects that would prevent them from living a normal healthy life. Pet quality is not show quality and most likely will not produce breeder or show offspring because of their defects. Pet quality stock are priced at a discount, contact me for prices and availability. Shipping is only available for young started birds (4+ months old) and some breeder birds. I DO NOT ship outside the Continental US, to Hawaii, or to Alaska. Check with your local post office for specific regulations. Shipping prices are subject to change due to the USPS changing their prices. Prices on birds do not include the shipping box or Express mail postage cost. You pay the actual shipping price plus the cost of the appropriate shipping box for your size bird and amount of birds. All birds are shipped via the United States Postal Service (USPS) using their Express mailing service, no exceptions. Spee-Dee shipping services are NOT available for Indiana. Insurance in the amount of $100 will be provided at no fee with every box (NOT per bird). Additional insurance is available upon request and will be an additional charge per USPS prices (which is usually just a couple dollars more). I ship birds as the weather permits. The USPS will ship lives when temperatures are above 10ºF and below 85ºF degrees. I don't ship if its over 70ºF for day time highs or under 32ºF. Some zip codes are restricted for air flight and ground shipping is sometimes an option. I ship live birds on Mondays and Tuesdays. Since the USPS does not guarantee that live birds will arrive overnight, even when shipped Express be forewarned that shipping is at your own risk but to date we have not had any cases of lost/dead birds. Healthy birds ship very well. Express has guaranteed delivery of 1-3 days for live birds. It is your responsibility to make sure you can PICK THE BIRDS UP FROM THE POST OFFICE AS SOON AS THEY ARRIVE! It is extremely important that you let your post office know in advance that you are expecting a shipment of live birds and that you want to be notified as soon as they arrive. It is your responsibility to make arrangements with your post office about pick up and leaving your phone number with them so they can contact you when the birds arrive. I will email you the tracking number for the package so you can track it online but be warned that the USPS is very bad for not updating tracking information. You have to provide me with your phone number so I can mark the outside of the box with your phone number in the event the shipping label becomes damaged or is accidentally removed. If there are any weeks you will be out of town and cannot receive birds please let me know ASAP. I do not replace or send refunds for DOA birds or birds that die shortly after arrival. Claims can be filed for late delivery or dead birds with the USPS. I advise you to open the box in the presence of a postal worker when you pick up your birds. If you cannot get help from your local post office workers ask them for the phone number of the local Consumer Affairs and ask them for help. I will help where I can but I don't have much experience with filing claims with the USPS because I've not had many problems with them. The actual and final amount for postage will be determined when I have picked out your birds because the postage is based largely on weight. Once I’ve picked your specific birds out I will weigh them and I will let you know the total amount for postage that will be due before the birds are shipped. I can estimate a weight pretty accurately because I've shipped several birds. Please send me your shipping information! When you buy from me I need your name, street address, city, state, zip code, phone number, and email address in order to ship you birds. I will not add your name to my wait list if you do not provide this information to me if you need birds shipped to you!! Acquiring the shipping box is my responsibility. However, if you want to purchase your own box and have it shipped to me then you are welcome to do so. I will just need you to let me know you plan on doing that. The price for the shipping box is nonnegotiable and based on the amount and size of your birds. I shop around for the best prices and buy in bulk whenever I can to save. All boxes will be Horizon Micro-environments brand, no exceptions. I will not sacrifice quality when it comes to shipping my birds. It usually takes 7-10 days for me to receive the box(es) from my suppliers. Unfortunately I can't make any guarantees once a bird or egg leaves my farm due to circumstances beyond my control, such as tragedies in shipping or owner's improper care after arrival. I do not guarantee fertility or hatchability. I do not accept any returns or issue any refunds. I will do everything in my power to make a situation right but at my discretion and within reason. If you are interested in purchasing live birds you must contact me before sending payment since prices and availability are constantly changing. I prefer you pay cash if you are picking up birds from my farm or a show. I prefer checks and/or money orders for deposits. For shipped birds I accept PayPal payments, checks, and money orders. BIRD ORDERS ONLY: For PayPal payments, there will be a 3% service fee to cover what PayPal charges me to receive payments. a check or money order.